Hundreds of people who survived December's tsunami have protested in southern Sri Lanka about the poor distribution of aid. Some 400 people demonstrated in the town of Matara. The government has admitted aid has reached only about 30% of nearly a million people who need it. Three officials have now been suspended for mishandling aid. The tsunami killed nearly 31,000 people in Sri Lanka. Independence Day ceremonies were toned down on Friday as a mark of respect. Police said the protest in Matara was noisy but peaceful. One local officer told AFP: "They were shouting slogans against corrupt officials. They are angry because they have been overlooked or aid is slow in reaching them." One aid official in Matara was suspended for allegedly being drunk. Another two in Galle were suspended for allegedly channelling aid to friends unaffected by the disaster. W Weerakoon, an administrator in Galle, said 10 more officials were being investigated on the same grounds following complaints by victims. On Tuesday, Sri Lanka's top tsunami aid distributor criticised the country's relief work. "I want to make sure that at least by February 10 or 15, everybody would have received their relief supplies," he said. Friday's Independence Day festivities were toned down out of respect for the tsunami victims. 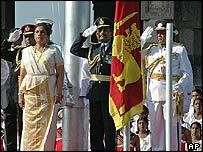 There was a scaled-down military parade in Colombo and President Chandrika Kumaratunga led a two-minutes' silence. "We have to stand together if we are to meet the challenges posed by mother nature herself, leave alone disasters that we have generated for ourselves such as conflicts and wars," she said. Rhetoric from the Tamil Tigers was also muted, although many buildings hoisted black flags in the north and east, where the rebels have been fighting for their own homeland.